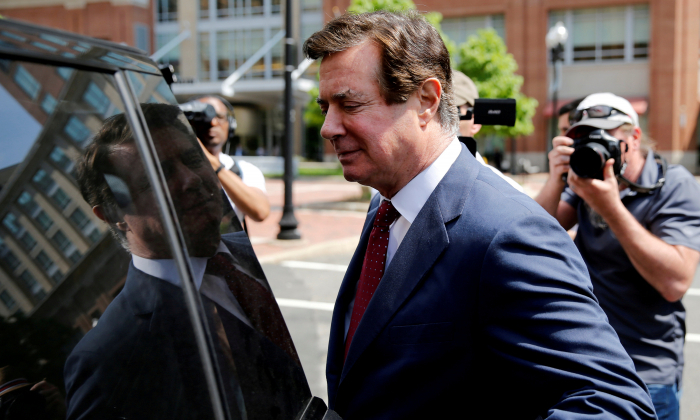 Federal prosecutors began their arguments in the trial of Paul Manafort on July 31, alleging that he opened more than 30 bank accounts in three foreign countries to “receive and hide” his income from Ukraine. Manafort, a former campaign chairman for President Donald Trump, is charged with a range of crimes that are unrelated to Trump’s presidential campaign. The high-profile trial is the first to arise out of special counsel Robert Mueller’s probe. Earlier in the day, prosecutors and defense attorneys selected a 12-member jury to weigh Manafort’s fate. Mueller has been investigating claims of Russian meddling in the 2016 election and allegations of collusion between Trump-campaign associates and Moscow. The Manafort trial is not related to either part of the investigation. Manafort is charged with hiding tens of millions of dollars earned in Ukraine in offshore accounts and defrauding banks for loans. Four alternate jurors—three women and one man—also were chosen. “A man in this courtroom believed the law did not apply to him. Not tax, not banking law,” Uzo Asonye, one of the prosecutors in Mueller’s probe, told the jury of six men and six women in federal court in Virginia, referring to Manafort. Manafort, 69, wore a dark suit, white shirt, and a tie. U.S. District Judge T.S. Ellis made several jokes during the jury selection process, including about the quality of the lunches to be provided to jurors. While many in the courtroom laughed, including Manafort’s lawyers, the defendant himself did not. While the tax- and bank-fraud trial represents the first test of Mueller’s ability to win a conviction of a former Trump aide, a conviction would still leave Mueller empty-handed when it comes to proving the Russia collusion claims. The special counsel has not produced any evidence or indictments related to collusion since his appointment in May last year. Three other Trump aides, including Manafort’s longtime business partner Rick Gates, have already pleaded guilty to charges unrelated to the campaign or collusion and are cooperating with Mueller’s probe. Prosecutors have said they will not present evidence of collusion at this trial. Prosecutors are seeking to provide details of Manafort’s work for a pro-Russia political party in Ukraine, raising the possibility that new information about his Russian connections could emerge. Manafort has filed a motion to have details of that work excluded from the trial. Manafort faces 18 criminal counts, which center on allegations that he hid much of the $60 million he earned in Ukraine in undisclosed accounts and failed to pay taxes on it. Prosecutors also accuse him of lying to U.S. banks to obtain real estate loans in a bid to maintain a lavish lifestyle after his client, former pro-Russia Ukrainian President Viktor Yanukovych, fell from power in 2014. Manafort actively conferred with his lawyers during the jury selection process, writing and passing notes. Manafort’s wife, Kathleen, was sitting behind him in the courtroom. Mueller took over the FBI’s counterintelligence probe, which began in the summer of 2016. That investigation is facing intense scrutiny in Congress since, among other issues, the FBI used a dossier funded by the Clinton campaign and the Democratic National Committee as evidence to gain a warrant to surveil a Trump campaign volunteer. Trump denies any collusion with Russia. The Virginia trial will be followed by a second one in Washington in September, in which Manafort face charges related to money laundering, failing to register as a foreign agent, and witness tampering. Manafort also has pleaded not guilty to those charges.